Say, I think I forgot to tell you about the cool anniversary gift MLB presented me during our recent trip to Santa Fe. That's a photo of it floating off to the right. Yep, it's a knife...a Benchmade Model 470 Osborne Emissary, to be exact, and it's the best knife I've ever owned. It's got a 3" blade made from S30V stainless steel (a powder-made steel) with ambidextrous thumb-studs and a spring assist that allow easy one-handed opening. The aluminum alloy frame makes the knife quite lightweight (just over 2 ounces), including the reversible pocket clip. It's even got a safety catch that prevents it from opening (or closing...although that seems like overkill, given that it's got a bulletproof locking mechanism). American Handgunner Magazine describes it as "...a knife with the strength, speed and refined looks to go from a boardroom to a back alley, and handle either with ease." I don't frequent either of those things, but it works just as well in the garage or back yard. Benchmade knifes are high quality, made-in-America products, and they're not inexpensive. But a good knife will outlive you, assuming you don't lose it. I bought my brother a Subrosa - a bigger model than mine; his work calls for it - for his birthday earlier this year and he loves it. If you're in the market for a new knife, skip the department store brands and check out Benchmade. And if you live in West Texas, you can buy these knives at prices under the MSRP at the new Bear Claw location in Midland, on the Andrews Highway just west of the hospital. You can also buy them online at substantial discounts over the Benchmade website's prices, but there's nothing like being able to handle a blade before making the buy. Embarrassing confession: I wrote this entire post about the wrong knife and even had the wrong photo, and realized it only as I was about to save it. 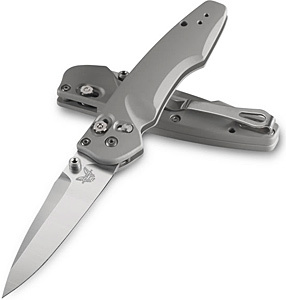 In my defense, the Benchmade website refers only to the "470 Emissary" while the knife itself is marked "Osborne Design." A search for "Osborne" on the website turned up a model similar to mine, so similar in fact that I didn't initially notice the difference in the photo. Perhaps I'm not qualified to carry a knife. This page contains a single entry by Eric published on July 27, 2011 6:23 AM. Scenes from a train station was the previous entry in this blog. Movie Review: "Cowboys and Aliens" is the next entry in this blog.